Born 1937, He grew up in Belfast and studied sculpture at the Belfast College of Art 1956 to 1960. 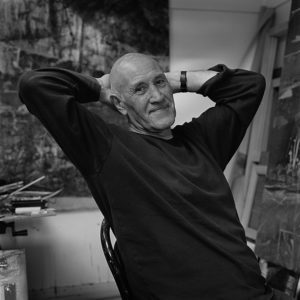 After leaving he took up painting to hold his first exhibition at the Arts Council Gallery in 1965. Regular one person Exhibitions have been held at the Fenderesky Gallery Belfast the Kerlin and most recently Hillsboro Fine Art Dublin. He has also shown at the Academia San Carlos, Mexico City. Selected work has been included in touring exhibitions abroad, the most recent being “When Time Began To Rant And Rage”. A mid term review was held at The Arts Council Belfast in1984 and a major retrospective at The Ulster Museum in 2000. He recently retired from teaching at the University of Ulster where he was a Reader in Painting, and for a period Head of Fine and Applied Art.